* He'll be ready for those everyday James Bond emergencies with this 13-function Army knife, which includes a screwdriver, nail file, scissors, knife, corkscrew and bottle opener. * High-quality stainless steel craftsmanship ensures a long, manly life for this personalized gift. 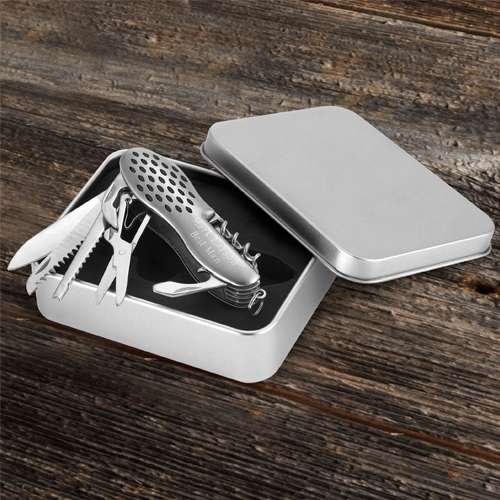 * Knife comes packaged in a sleek tin box lined with custom foam. * Knife Size: 3 1/2" x 5/8" (closed). * Box Size: 4 3/8" x 3 3/8" x 1 1/8". 3.5" x 2" x 0.625"